SALINLAHI to Pope about Lumad killings and attacks on schools: Help lumads. Impart us your Apostolic Blessing! In a peaceful gathering in front of the Apostolic Nunciature in Malate, Manila early morning today, child rights organization SALINLAHI Alliance for Children’s Concerns together with Save Our Schools network members appealed to Pope Francis to hear and give attention on the plight of thousands of lumad children who are caught amidst the massive militarization of indigenous communities in Mindanao. The group was joined in by lumads themselves who presented the letters they wrote for the pontiff. ‘With His solicitude and high regard for human rights and dignity, we are confident that Pope Francis values children, especially the frail and marginalized such as our lumad brothers and sisters in Mindanao. They have a special place in his heart,’ said Salinlahi secretary general and Save our Schools Network lead convener Kharlo Manano describing Pope Francis, who recently made a remarkable support for the refugees who fled Syria to escape the civil war gripping the country. According to Manano, massive exodus of people threatened by state forces’ rights violations is among the predicaments faced by our indigenous brothers and sisters in Mindanao. ‘In Surigao del Sur, nearly 3000 individuals – half of which are children, were forced to flee their homes in fear after paramilitary forces Magahat-Bagani killed a lumad educator and two leaders earlier this month’ he continued. Last September 1, Emerito Samarca, executive director of Alternative Learning Center for Agriculture and Livelihood Development (ALCADEV), Malahutayong Pakigbisog Alang sa Sumusunod (MAPASU) chair Dionel Campos and his cousin Datu Jovillo Sinzo were gunned down by the elements of paramilitary group Magahat-Bagani forces, a group trained and supported by the Armed Forces of the Philippines (AFP). ‘Walang awa nilang pinaslang ang aking ama. Mismong sa harap ng mga taong nagmamahal sa kanya. Hindi ko maintindihan bakit pinatay nila ang aking ama na nagnais lamang na tulungan ang aming mga katribu at paunlarin ang aming lupang ninuno,’ said Michelle Campos, daughter of Dionel. Aside from Michelle, teachers from ALCADEV and relatives of the victims were present in the gathering. 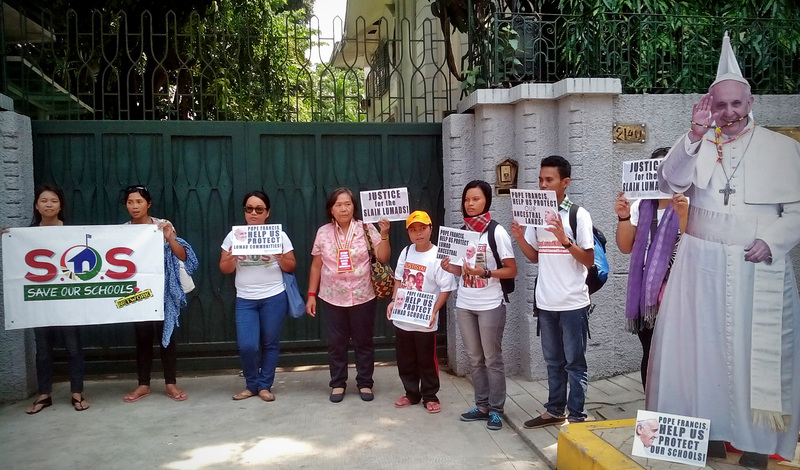 They travelled to Manila last week for a week-long trooping with different concerned government agencies and institutions to seek justice for the victims. In addition, the lumads offered a bead necklace, a lumad traditional emblem for friendship and peaceful solidarity, to pope together with their letters of appeal. ‘Pope Francis, hear our misery and prolonged sufferings. Help us protect the indigenous schools, communities and people in Mindanao. Impart us your Apostolic Blessing!’ ended Manano.